Erected 1991 by Citizens of Tuscarawas County. Location. 40° 29.379′ N, 81° 26.701′ W. Marker is in New Philadelphia, Ohio, in Tuscarawas County. Marker is on High Avenue (Ohio Route 39), on the left when traveling east. Touch for map. Marker is on the south grounds of the Tuscarawas County Courthouse (High Avenue and Broadway Street). Marker is in this post office area: New Philadelphia OH 44663, United States of America. Touch for directions. 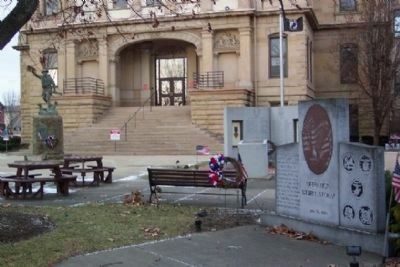 World War I Doughboy memorial in front of south courthouse entrance, while Vietnam memorial (with black POW/MIA flag) is to rear of Operation Desert Storm monument. At extreme right rear is the American Revolution memorial. More. 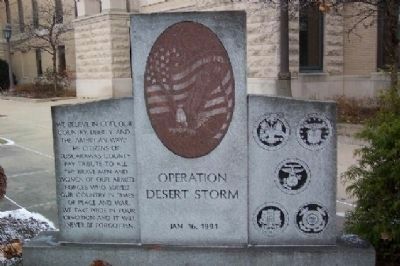 Search the internet for Tuscarawas County Operation Desert Storm Memorial. Credits. This page was last revised on June 16, 2016. This page originally submitted on January 12, 2009, by William Fischer, Jr. of Scranton, Pennsylvania. This page has been viewed 1,389 times since then and 6 times this year. Photos: 1, 2. submitted on January 12, 2009, by William Fischer, Jr. of Scranton, Pennsylvania. • Bill Pfingsten was the editor who published this page.